frightened by the diagnosis of diabetes and wonder what you can eat? puzzled about how to make your favorite recipes diabetes-friendly? flustered about how to lower carbohydrate, increase fiber and decrease sodium? unclear if you need to steer clear of sugary foods and sweets? The Diabetes Food and Nutrition Bible, published by the American Diabetes Association is a two-in-one super resource for people with diabetes. It’s an “educational cookbook” co-authored by Hope and culinary guru and best-selling diabetes cookbook author Robyn Webb. The Diabetes Food and Nutrition Bible is filled with over 100 recipes featuring 20 Nutrition Superstars - foods chock-full of nutrition. You’ll also find tips and hints about how to buy, store and cook myriad foods. Integrated into the pages is a comprehensive nutrition guide to help you learn what and how to eat to manage your diabetes. The pages are filled with plenty of easy and practical ways to improve your eating habits and food choices. And that’s not all. You’ll get two complete weeks of diabetes menu plans for various calorie levels which show you exactly how to fit in the book’s recipes and healthy eating ideas. "With Diabetes Food and Nutrition Bible ...you'll learn how food affects your blood glucose and how to eat healthier. You'll see that with a little creativity, you can live well within what can be quite comforting, good-tasting limits...Now read, learn, and inwardly digest a very reasonable approach." 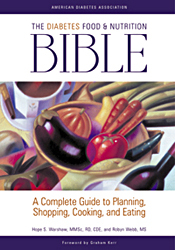 "Many cookbooks include the word 'bible' in the title. Few cookbooks merit it. An exception is The Diabetes Food and Nutrition Bible...The result is a book that debunks modern myths...The recipes are simple and streamlined...It's an interesting read not only for individuals diagnosed with or predisposed to diabetes, but anyone concerned about sound eating." “In The Diabetes Food and Nutrition Bible, Hope Warshaw and Robyn Web effectively collaborate to draw upon their more than twenty years of experience with the challenges of a diabetic lifestyle. No diabetics's reference shelf and cookbook collection can be considered complete without the inclusion of The Diabetes Food and Nutrition Bible!”"